Available now from TR & KR Shipton , the Kioti-Daedong Australia range of ride on mowers is built tough for people who want high quality power equipment with innovative features at an affordable price point. Built strong in the USA, Kioti-Daedong ride on mowers feature premium Briggs and Stratton engines, step through operator platforms, and side, mulch or catch deck systems. Included in the Kioti-Daedong range of ride on mowers is the DLT-1538, a tough and dependable machine that is very affordable. This ride on lawn mower features an easy to mount step through chassis, as well as simple controls that make using the mower a breeze. 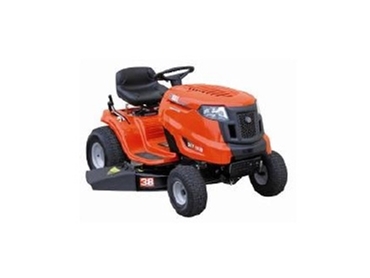 The 15.5hp Briggs and Stratton engine delivers all the power required to drive the DLT-1538 ride on lawn mower's twin blade cutting deck, ensuring a clean cut every time. Furthermore, with a six speed, 'shift on the go' vari-speed transmission, operators can select the right speed for their mowing conditions. Along with these features, the DLT-1538 ride on lawn mower features clean, modern styling making it a tough machine to beat.